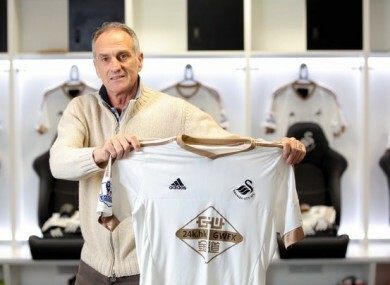 Italian Francesco Guidolin will work alongside Alan Curtis as head coach. PREMIER LEAGUE STRUGGLERS Swansea City have appointed Francesco Guidolin as head coach until the end of the season. Swansea sacked former manager Garry Monk in December following a run of one win in 11 Premier League matches. Club stalwart Alan Curtis was placed in temporary charge and Swansea later announced he would stay as manager until the end of the season. However, Curtis will now work alongside Guidolin until the end of the season, with Swansea moving for the experienced head coach on Monday. “We are very pleased with the appointment. His experience and knowledge will be a huge asset to the club,” said chairman Huw Jenkins in a club statement. “Although we recently appointed Alan Curtis as manager until the end of the campaign, he was aware and comfortable with the fact that we were still looking to bring someone in to assist if we found the right person. “We believe we have found that person in Francesco. He has an excellent record, especially with Udinese over the last few years. He created an Udinese side from a relatively small budget – compared to the rest of the league – that competed with the big teams in Serie A. He instilled a belief and motivation to compete and beat the best Italy had to offer. It is similar to what this football club is trying to do in the Premier League. “He also has a wealth of knowledge of players throughout Europe which will be a big boost on our recruitment side; something we have been reviewing in a lot more depth over the last few months. The 60-year-old has 28 years of head coaching experience and counts stints with the likes of Palermo, Parma, Bologna, Genoa and Monaco among his former clubs. Guidolin was most recently in charge of Udinese, but moved to an upstairs role after the club finished 13th in the 2013-14 season. Swansea added in their statement that “both parties have agreed to review the position at the end of the season with the option of extending the contract”. The Welsh club sit 18th in the Premier League but can move out of the relegation zone by beating Watford tonight. Email “Swansea appoint former Udinese and Monaco boss until the end of the season”. Feedback on “Swansea appoint former Udinese and Monaco boss until the end of the season”.